Polygons can be created in two ways, either from the Polygon tab in the Control Panel or directly from each view. 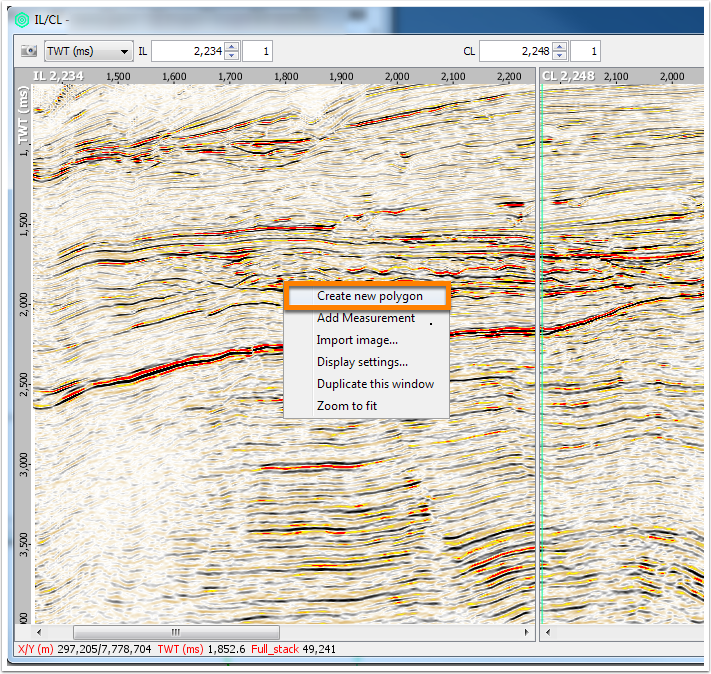 At the tab header, click the blue "+" icon and select New polygon or New Fault Polygon (see Using Fault Polygons). Type the name of the new polygon and click OK.
A new polygon will be added to the Polygon tree. Click the pencil icon and begin picking the polygon in the Map View, 3D View or any section views (i.e. IL/CL View, Arbline View). After a polygon point is placed, details will be updated with the Location. Choose a Horizon to draw the polygon at the horizon in 3D view. Choose the Line settings for the polygon. Check the Fill box to fill the polygon and choose a colour. Enable Show points in table to show the polygon point coordinates. 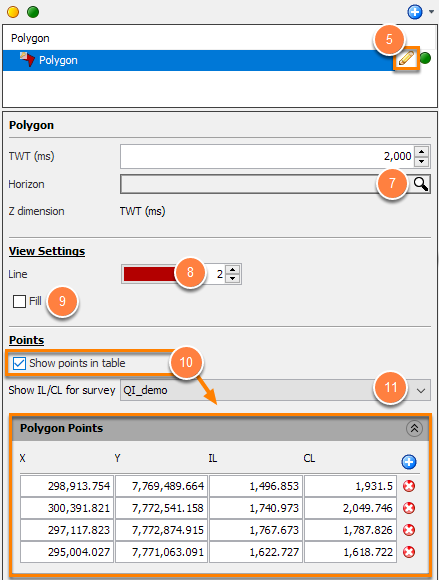 Select a Survey to display polygon point coordinates in the corresponding survey IL/CL. Open any View in Insight. Right click anywhere in the view and select Create new polygon. A new polygon is created in the Polygon tab. Editing mode is automatically enabled. Left click to add points (See Editing a Polygon). Press ESC or double-click to stop. To adjust the display settings, select the polygon in the Polygon tab of the Control Panel.